Wheaton College enjoys a tradition of self-referentially “doing up” its landmarks as tempting refreshments, usually presented at ceremonies or celebrations. 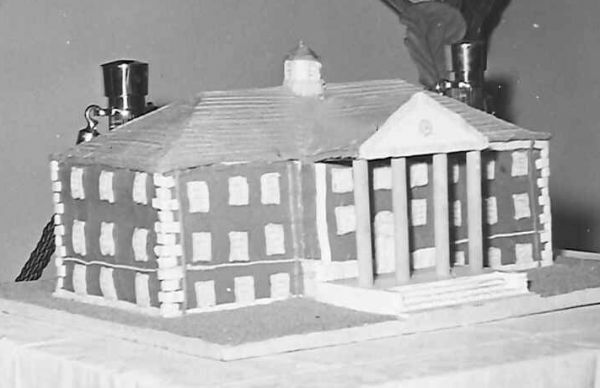 For instance, this cake, a replica of the newly constructed Memorial Student Student Center, was served at the grand opening in 1951. The ribbon was cut by Mrs. J.G. Read, mother of Gold Star son Lt. Glenn Read, a Flying Fortress Navigator reported missing over the English Channel during WWII. The first slice was extracted by Glenn Heck, Student Council Chairman. 1500 guests attended the open house. 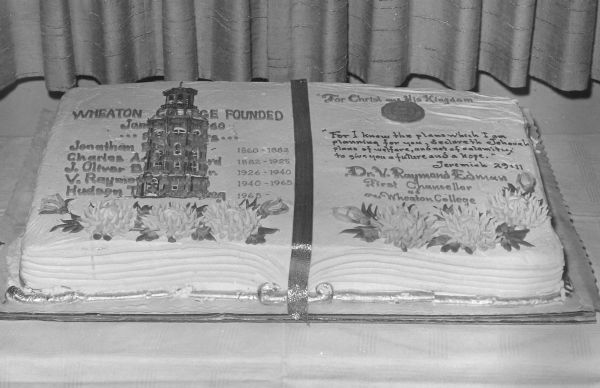 A few years later this appealing sheet cake, shaped like an open Bible, was served at the 1965 inauguration of Dr. Hudson Armerding, fifth president of Wheaton College. The previous presidents and their administrative tenures are cited in the frosting, along with an illustration of the iconic limestone Tower from Blanchard Hall. 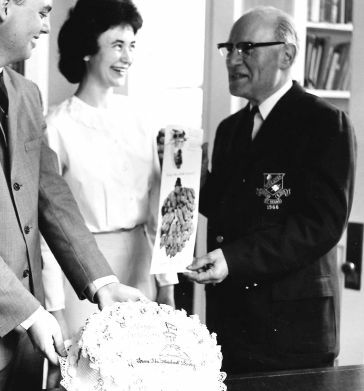 Dr. V. Raymond Edman, former president of Wheaton College, now serving as Chancellor, was treated to this birthday cake in 1966, presented by the student body. The greeting inscribed in frosting reads, “Happy Birthday, Prexy,” next to yet another representation of the Tower, a flag waving atop. 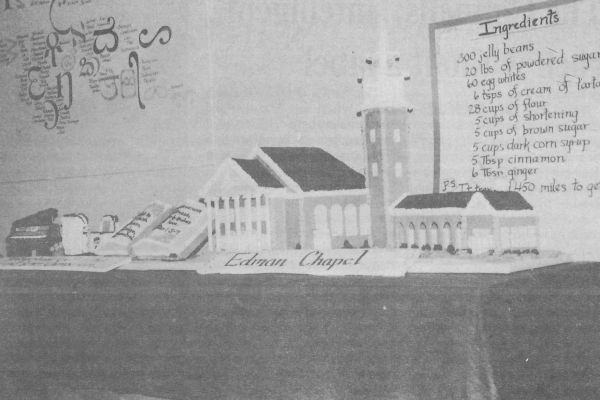 Below, this impressive gingerbread Edman Chapel was created by twins Kay and Karen Chamberlain, who displayed it in the lobby of the Memorial Student Chapel in 1992. Accompanying the display is a list of ingredients. 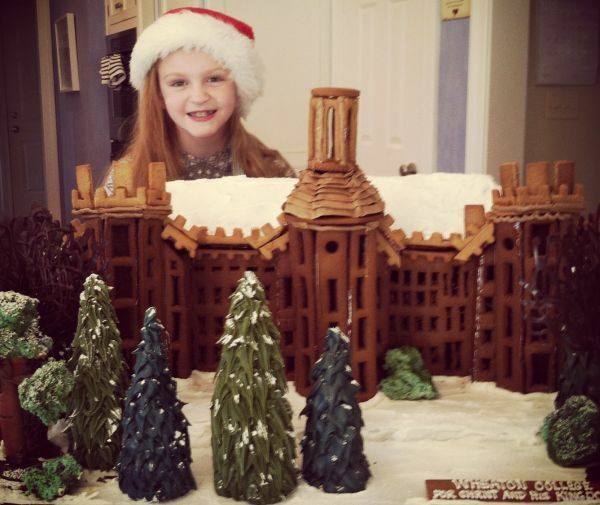 Blanchard Hall appears again as a magnificent gingerbread house in a 2013 Wheaton College promotional video, featuring Dr. Philip Ryken and family (including Miss Karoline Ryken, pictured) at Christmas.